The following discussion relates to drug interactions that may reduce the efficacy of clopidogrel (Plavix®). 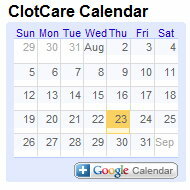 A related issue is the resistance to clopidogrel in individual patients which has been reviewed elsewhere on ClotCare at clotcare.org/clotcare/geneticclopidogrelresistance.aspx. Clopidogrel (Plavix®) is a widely used anti-platelet agent that is commonly combined with aspirin to reduce the risk of various cardiovascular events. Because of the associated increased risk of gastrointestinal bleeding with this combination, a proton pump inhibitor (PPI) is often prescribed during such therapy. Because clopidogrel is an inactive product that has to be converted to its active metabolite in order to be effective, there is considerable concern that some PPIs may reduce or block this conversion and, thereby, reduce the effect of clopidogrel. As discussed below, such inhibition of the effect of clopidogrel may be associated with a 25% or greater increase in recurrent events. The available data (as summarized in the table below) suggest that omeprazole (and perhaps 1 or 2 other PPIs) may reduce or block the effect of clopidogrel, while esomeprazole (Nexium®) and pantoprazole (Protonix®) probably do not. Clopidogrel must be converted enzymatically in the liver to its active form (the metabolite responsible for inhibition of platelet function) by the cytochrome P450 (CYP450) system, mainly CYP2C19. Certain PPIs may inhibit the enzymatic conversion of clopidogrel to its active metabolite, thus reducing the anti-platelet effect of the drug. Siller-Matula and colleagues evaluated the effect of pantoprazole or esomeprazole and clopidogrel on platelet activity by calculating PRI (derived from VASP assay) and measuring aggregation and concluded neither PPI was associated with decreased clopidogrel response.4 The investigators conducted a non-randomized observational study of 300 patients with ACS undergoing percutaneous coronary intervention (PCI). Patients received anti-platelet therapy with clopidogrel (600mg loading dose followed by 75mg/d) and aspirin (100mg/d) for at least 5 days at the time of inclusion. Comparisons were made between three groups of patients -- those on anti-platelet therapy and pantoprazole, anti-platelet therapy and esomeprazole, and anti-platelet therapy and no PPI. In the group treated with pantoprazole and clopidogrel (n = 152), the PRI mean was 50% and the platelet aggregation was 47 U. In the esomeprazole plus clopidogrel group (n = 74), the PRI mean was 54% with an aggregation of 42 U. The patients in the group treated only with anti-platelet therapy and no PPI (n = 74), the PRI mean was 49% with an aggregation of 41 U. The p-value for the comparison was 0.3824. Thus, the results of this trial demonstrate the lack of interaction between either pantoprazole or esomeprazole and clopidogrel, and, therefore, there does not appear to be a reduction in clopidogrel efficacy with the concomitant utilization of these two specific PPIs. In conclusion, the drug-drug interaction between clopidogrel and proton pump inhibitors is likely mediated by inhibition of CYP2C19, especially in light of studies which showed decreased clopidogrel efficacy in patients with a CYP2C19 reduced-function allele.7, 8 The current literature supports an interaction between clopidogrel and certain PPIs, principally omeprazole, rabeprazole, and lansoprazole . While only a small percentage of patients in the above mentioned trials received rabeprazole, those who did appeared to exhibit a similar response to those who received omeprazole. Additionally, the study by Li and colleagues show in vitro inhibition of CYP2C19 via a rabeprazole metabolite. Similarly, the data behind the lansoprazole interaction do not provide a clear answer. Given the availability of alternatives that do not interact, it may be prudent to er on the side of caution in the case of both rabeprazole and lansoprazole. If acid-suppression is required, one may choose to utilize an H2-receptor antagonist (with the exception of cimetidine), which have not been shown to interact.9 However, if a PPI is selected, one should exercise caution when using omeprazole, rabeprazole, or lansoprazole and clopidogrel concomitantly. Instead, one may choose to use either esomeprazole or pantoprazole, which appear to have little, if any, effect on clopidogrel's inhibition of platelet function. Gilard M, Arnaud B, Cornily JC, et al. Influence of omeprazole on the antiplatelet action of clopidogrel associate with aspirin: the randomized, double-blind OCLA (Omeprazole CLopidogrel Aspirin) study. J Am Coll Cardiol. 2008; 51(3): 256-260. Juurlink DN, Gomes T, Ko DT, et al. A population-based study of the drug interaction between proton pump inhibitors and clopidogrel. CMAJ. 2009 March 31; 180(7): 713-718. Ho PM, Maddox TM, Wang L, et al. Risk of adverse outcomes associated with concomitant use of clopidogrel and proton pump inhibitors following acute coronary syndrome. JAMA. 2009; 301(9): 937-943. Siller-Matula JM, Spiel AO, Lang IM, et al. Effects of pantoprazole and esomeprazole on platelet inhibition by clopidogrel. Am Hear J. 2009; 157(1): 148.e1-148.e5. Li XQ, Andersson TB Ahlstrom M, et al. Comparison of inhibitory effect of the proton pump-inhibiting drugs omeprazole, esomeprazole, lansoprazole, pantoprazole, and rabeprazole on human cytochrome P450 activities. Drug Metab Dispos. 2004; 32(8): 821-827. Small DS, Farid NA, Payne CD, et al. Effects of the proton pump inhibitor lansoprazole on the pharmacokinetics and pharmacodynamics of prasugrel and clopidogrel. J Clin Pharmacol. 2008; 48(4): 475-484. Mega JL, Close SL, Wiviott SD, et al. Cytochrome P-450 polymorphisms and response to clopidogrel. N Engl J Med. 2009; 360(4): 354-362. Simon T, Verstuyft C, Mary-Krause M, et al. Genetic determinants of response to clopidogrel and cardiovascular events. N Engl J Med. 2009; 360(4): 363-375. Small DS, Farid NA, Li YG, et al. Effect of ranitidine on the pharmacokinetics and pharmacodynamics of prasugrel and clopidogrel. Curr Med Res Opin. 2008; 24(8): 2251-2257.